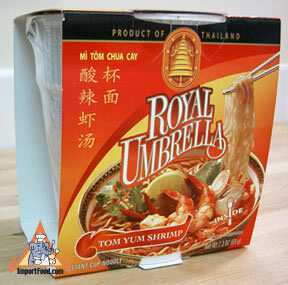 The most innovative company making prepared frozen and instant Thai packaged food today is Royal Umbrella, owned by the presigious CP Group. This company spares no expense in packing modern instant noodles using the most advanced and sanitary machinery. They've done a fantastic job getting a "True Thai Taste" in this instant tom yum soup. Taste is excellent! You get one case (see below) of 12 cups, each cup is a generous 2.3 oz serving. Each cup is shrink-wrapped and protected with a protective color paper jacket. Inside each cup is a packet of chile paste in soybean oil, and a convenient folded fork that snaps into position. Simply add boiling water, set for a few minutes, and enjoy! Tom Yum Vegetarian ingredients: wheat flour, palm oil, tapioca starch, salt, msg, white sugar, citric acid, dehydrated vegetables (cabbage, carrot, corn), dehydrated mushroom, pickled radish, disodium guanylate. Product of Thailand. Tom Yum Shrimp ingredients: wheat flour, palm oil, tapioca starch, salt, anchovy extract, msg, white sugar, citric acid, dehydrated vegetables (corn, carrot, green onion, corriander), dehydrated shrimp, dried shrimp, disodium guanylate. Product of Thailand.